An internationally recognised poultry breeder once resided in Berowra, occupying the vast expanse of land where Hillcrest Public School now stands. Mr James Stewart was a well-known identity in the early days of Berowra due to his pioneering work in the development of poultry farming in this region. Mr. Stewart kept over 1000 laying White Leghorns on his property, known as Hillcrest Poultry Farm. Between the years 1911-12, Mr. Stewart entered an international competition, sending his prized birds to a wintery Vancouver, in Canada. Apparently, the Ozzie birds from Berowra triumphed laying prize-winning eggs in six inches of heavy snow, beating all the local competitors. As early as 1906, James Stewart’s Hillcrest Poultry Farm was flourishing. No doubt, as ‘Breeders of Pure Bred Heavy Laying Strains’ they provided a sustainable living for the Stewart family as evidenced by the document shown in this blog. 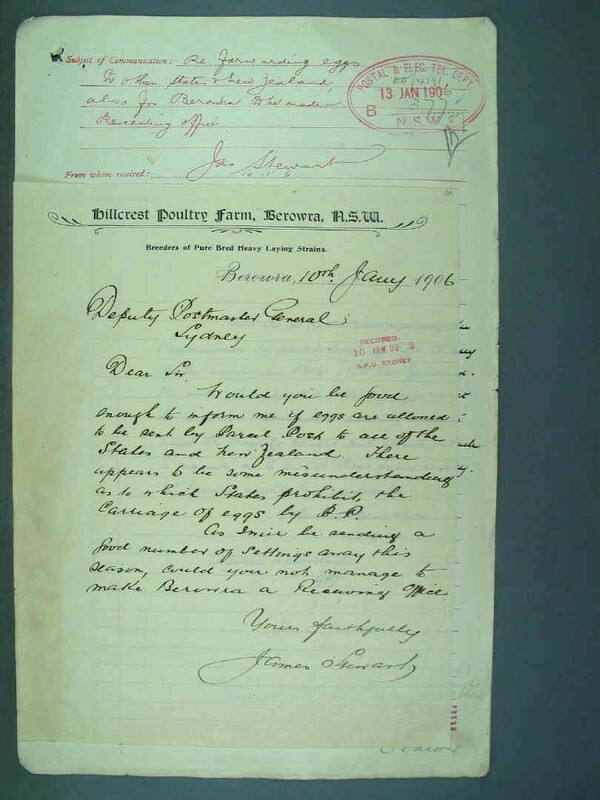 In this letter, Mr. Stewart requested the carriage of eggs by ‘Parcel Post’ to a wide distribution area – to all of the States in Australia and New Zealand. But can you imagine sending eggs via post? But in those days, the post office was the hub of any rural town, providing many different services such as the one described here. I wonder if Mr. Stewart managed to persuade the Deputy Postmaster General in Sydney to make Berowra a receiving office? Maybe yes – since the heavy laying hens won an international competition some five years later.